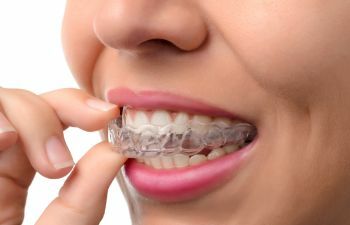 What attracts most patients to Invisalign clear orthodontics is the obvious (or not so obvious) aesthetic advantage of straightening their teeth without others noticing. However, Invisalign provides further benefits that pertain to the health of your smile and your overall health. A profound benefit of Invisalign is that the aligners are removable for brushing and flossing. This makes your cleaning job easier and more effective. Many patients struggle to maintain the health of their teeth and gums while in metal braces due to limited access to the surfaces and in-between areas of teeth. Not only can you take out your Invisalign trays for brushing, but you can remove them for eating too. This facilitates a healthier and more balanced diet while undergoing orthodontic treatment. Patients do not have any restrictions on what they can eat during Invisalign therapy, which means you will not have to rely on a soft foods diet and can consume more nutrient-dense foods. A healthier diet, better cleaning and improved gum health all work towards a strong body. Oral infections and gum disease can be associated with overall health issues, such as heart disease, stroke and diabetes. With Invisalign, you can be confident that you are making a wise decision for your smile and your body health. At Georgia Orthodontics & Children’s Dentistry, we are proud to offer safe, convenient and effective ways to straighten your smile. Please give us a call to learn if Invisalign is right for you!